The film might have worked best as a short subject, but it simply doesn’t have enough ideas to sustain a full length animated film. It’s early scenes are the ones most likely to get your tale wagging – where we witness dogs, cats, birds, and other assorted animals in a New York CIty apartment building indulging themselves while their owners are away. They’re either nibbling on leftovers, partying with other dogs, going on walks or chasing squirrels. It’s the kind of thing that will amuse young viewers, and is kind of blandly palatable to parents trying to catch a breather in a darkened theater. Louis C.K. takes the voice lead as Max, a terrier pound puppy who loves nothing more than to just hang out with his owner. 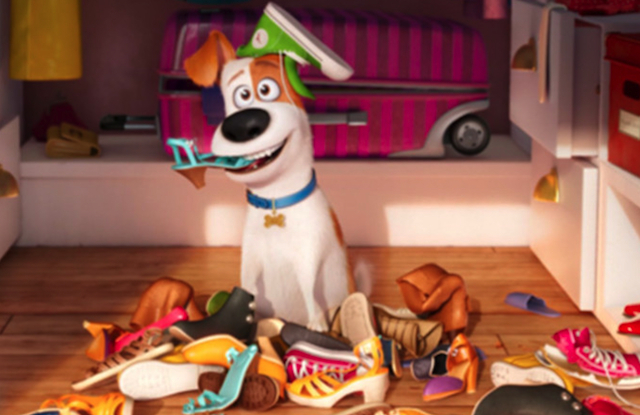 His simple life gets upended when his owner brings home a big scruffy mass of a dog named duke (voiced by Eric Stonestreet). From there the film abandons its simple plot and sends its uneasy buddy team onto a madcap race into the New York City sewers while dodging animal control and running into a murderous gang of discarded pets.